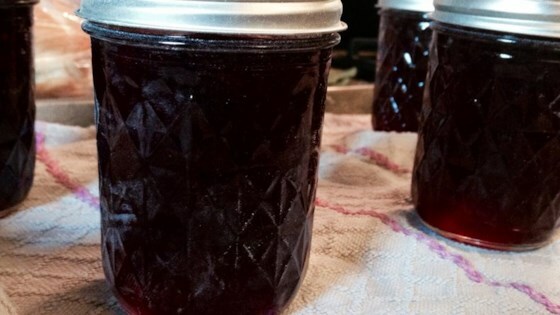 "At one time my mother in law would make many different flavors of jams and jellies. This is one of her old recipes that she has given to me." Sort and wash grapes, and remove stems. Place them into a large kettle and crush them. Add water, cover, and bring to a boil over high heat. Reduce heat to low, and simmer for 10 minutes. Remove from heat, and extract juice. Allow the juice to stand in a cool place overnight to prevent the formation of crystals in the jelly. Strain the juice through a double thickness of damp cheesecloth. Measure 4 cups of the juice into a large pot. Stir in the sugar. Quickly bring to a full rolling boil. Stir in pectin, and allow to boil hard for 1 minute. Remove from heat, and skim off foam. Pour into hot sterile jars, and process for 5 minutes in a boiling water bath. We have updated this recipe due to a typo in step 2. The amount of juice should be 4 cups, not 4 quarts. This is a very good recipe, although i personally would cut back on the sugar by a half cup to a cup, it seems extreamly sweet.